Yesterday was a big day for our family. Actually, the entire weekend was. By the time Sunday night rolled around, I was so tired I could barely see straight, and I was amazed that we had packed so much into so little time. Friday night after Tom got home from work, we drove to Syracuse to visit his parents for the weekend. We woke up bright and early on Saturday morning and went to the NY State Fairground to see a really large train show. The boys were enthralled by all the model trains and wanted to look at every single display. Last year, Tom and his dad took the boys and spent the whole time carrying them from one display to the next. I understand why the model train builders put them so high off the ground, but it's torturous for parents. 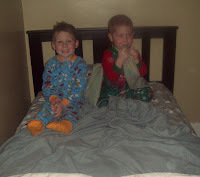 This year I invested in a small collapsing step stool that the boys could carry and stand on whenever they couldn't see. It was a lifesaver and kept everybody happy! After the train show, Tom and I went shopping by ourselves! That never happens and everything went so much more smoothly. First we went to Raymour and Flanigan looking for a new twin bed for John. 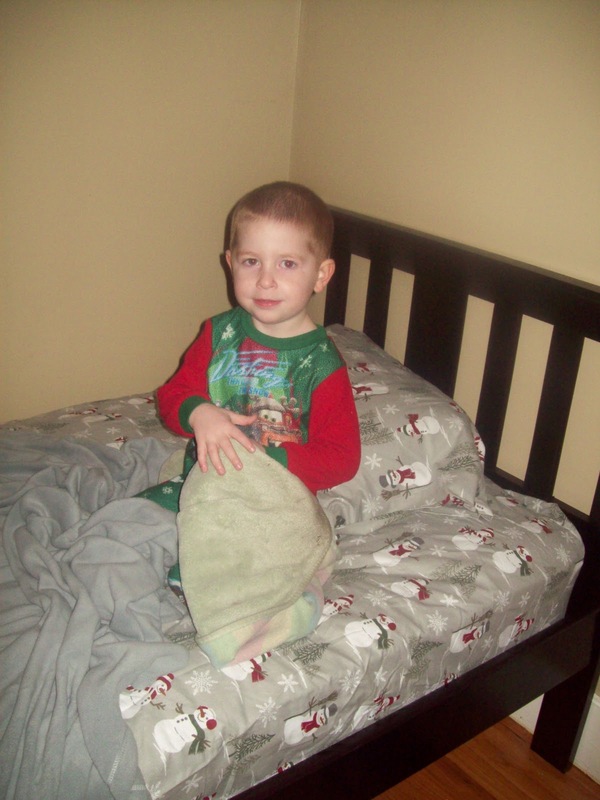 He's outgrown his toddler bed, and was spending nights in our bed--so everybody was miserable! The one we found that we liked okay was $800, so we didn't stay there long! After that we went to the mall to look at getting some window treatments made. I was bored by the fabric choices, but since my dream fabric isn't in stock, I'm having to compromise my design asthetic. Tom and I quickly realized that we couldn't pick out window treatment fabric without some idea of how we were going to paint the house, so next it was off to Lowes... We developed a palette for the house (we're sticking with yellows and reds) and then looked at their window treatments. I think now we're leaning more toward rolling shades instead of roman shades. It was nice to be able to take our time land look at all our options. Sunday morning we got up even brighter and earlier (damn you, daylight savings), packed and got ready to head home. I was going to drive back from Syracuse (with the dogs) and Tom and the boys were coming back on Amtrak. We'd been promising the boys an Amtrak trip for months (years?) and it seemed like every time we thought we might get tickets, the fates conspired against us. But last weekend, prices were reasonable, the weather was pleasant, and the times worked out perfectly, so we went ahead and bought tickets. The boys had a great time and were really excited when they got off at the train station in Schenectady. And as if everybody wasn't tired enough, from there, like the masochists we are, we headed straight to Albany to look at furniture. The first place we went was having a sale, but didn't have the kind of bed we were looking for. We wanted a solid wooden bed with a dark espresso finish that would match the chest of drawers John already had. So Tom and I decided to try Huck Finn's Warehouse. I'd been there before, right after we moved to the area, and I knew it was visible from one of the interstates, was on the outskirts of town, and in a big warehouse near other big warehouses... Note to self: these are not particularly helpful details when you are driving in circles all over downtown Albany. After Tom and I toured parts of I-90, I-87, and I-787 with no luck, out of desperation I started calling friends with internet access. Thanks to our friend Jason and his smart phone, Tom and I managed not to kill each other. Another note to self: Engineers do not appreciate directions by gut feeling. Huck Finn's DID have the perfect bed, and we were able to get it and a mattress right away AND bring it home in the mini-van. I love when I don't have to wait for furniture! 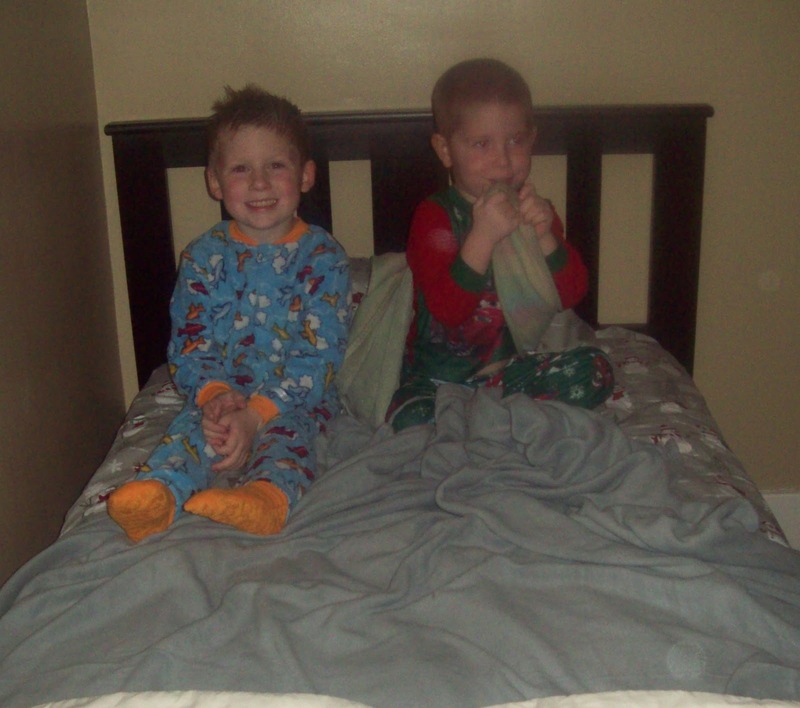 On the way home we stopped at Target for some twin flannel sheets (Snowmen! Yeah!) and a mattress protector (leaky Pull-ups...boo...). 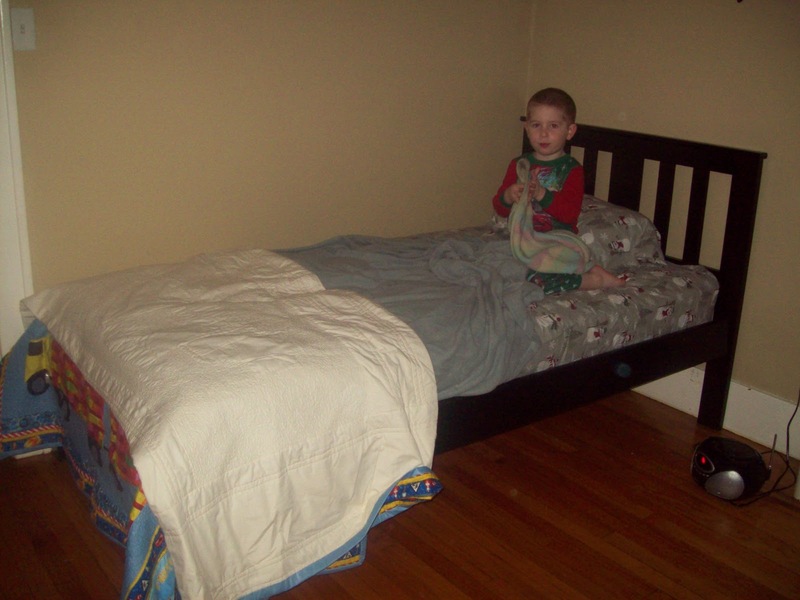 Once we finally got home, Tom whipped it together in no time at all, which was awesome because John hadn't had a nap and was ready for bed. honey took my younger two to a model train show this weekend, too! his office mate's neighborhood in williamsburg is full of train geeks and they run and open house tour day in the fall and in the spring every year with really impressive displays. #2 took his video camera this year to record 'inspiration' for his stop motion monster movies sets. thats the most happiest caged boys i have every seen! they look very darling!